You are currently browsing the daily archive for March 30, 2013. In Parliament yesterday I told Dr Jayalath Jayawardena, who is a master manipulator, that instead of making insidious use of the government’s misfortunes, he should be constructive, and move a motion to suggest that Prof Pieris be replaced as Foreign Minister by Dr Dayan Jayatilleka. He told me, characteristically, that he would be happy to suggest me instead, but I assured him that I knew my limitations. I had no doubt that I would do a better job than Prof Pieris, but so would almost anyone in this room – but there was no need to think of simply improving on what we have, when there is available a man who understands international relations thoroughly, and whose track record is one of great success. I was reminded then of what Mangala Samaraweera – yet another Foreign Minister who was certainly better than the incumbent – had said a couple of years back, when he accused me of being responsible for all the ills from which he thought the country was suffering. When I asked for an explanation he expanded this to include Dayan as well, claiming that it was because of the victory in Geneva in 2009 that the government thought it had leeway to do whatever it liked. Dayan Jayatilleka .. a man who understands international relations thoroughly, and whose track record is one of great success. Though I was involved at the time with Dayan, I cannot take credit for the triumph he architected. 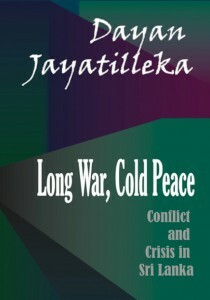 Although the size of the victory led idiots in Colombo to assume that any idiot could achieve such a victory – which perhaps explains the failure to register the intellectual weaknesses of his immediate successor – in fact what he achieved was carefully crafted, in terms of the principles that he and Tamara Kunanayakam expressed so eloquently at the discussion on Foreign Policy that the Liberal Party organized earlier this week. Dayan pointed out that the thin, ie bare bones, notion of sovereignty we assert needs to be thickened through a sincere commitment to pluralism that encompasses all within the bounds of that sovereignty. Tamara noted the importance of strengthening our bargaining power through alliance building and genuine cooperation, not just asking for votes at a time of crisis. Our failure to work on these lines was apparent in perhaps the most worrying element of the vote on Thursday, which was Brazil voting against us. Instead of getting upset with Brazil about this, we should try to understand why a country that voted with us in 2009 now votes against. Does it have something to do with our failure to engage with them, as exemplified by the manner in which the Ministry of External Affairs sabotaged the decision of the President to send Tamara as a sort of roving ambassador to South America? Does it have something to do with the fact that, when she had begun the process of winning back the support in Geneva that her predecessor had squandered (as was exemplified by the manner in which, in September 2012, she ensured that the effort of the Canadians to put us on the agenda was resisted), she too was dismissed.